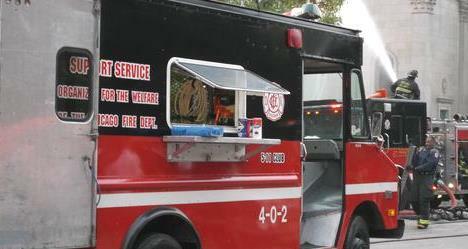 The Canteen Service: The primary mission of the 5-11 Club is to provide canteen service to the members of the Chicago Fire Department. 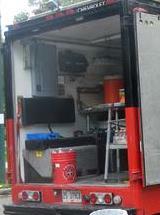 The 5-11 Club owns and operates two canteen vehicles. 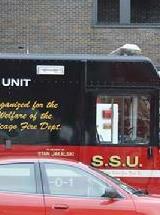 SSU 1 is located at Engine106's quarters at 3401 N. Elston Avenue, while SSU 2 is located at Engine 80's quarters at 12701 S. Doty Avenue. 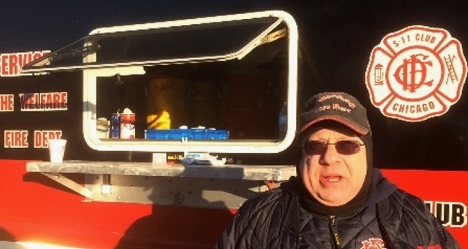 The canteens, which are known as Support Service Units, are stocked with food and beverages such as bottled water, Gatorade, hot chocolate, and coffee. 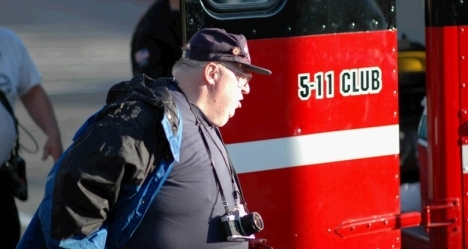 When an extra alarm fire is sounded, the volunteer members of the 5-11 Club report to unit nearest to the scene of the incident, pack food and beverages onto the Support Service Unit and respond to the scene of the fire. 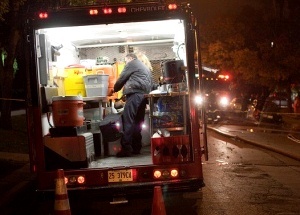 Once they arrive at the scene of the fire, crew members use the Support Service Unit as a platform to distribute food and beverages to all emergency responders. 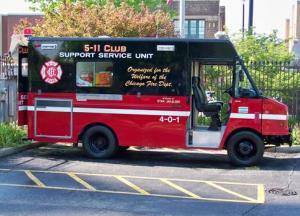 The secondary mission of the 5-11 Club is to provide the canteen service at special events related to the activities of the Chicago Fire Department and the Chicago Police Department, such as large-scale training drills, classes, HBT incidents, crime scene investigations, funerals for Firefighters and Police Officers who have died in the line-of-duty, and the annual memorial service for Chicago firefighters who have died in the line-of-duty. 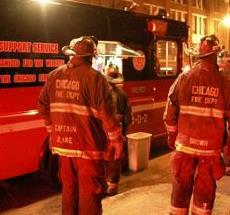 All food and beverages distributed to members of the Chicago Fire and Police Departments, Municipal City employees, (as well as any civilian(s) who are displaced by the fire, disaster, or incident, requesting food and beverages) are handed out free of charge. 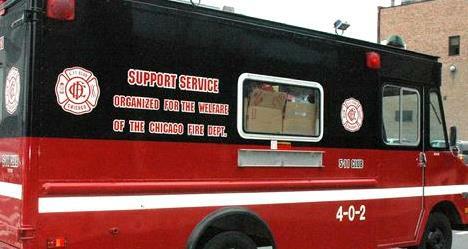 All food and beverages distributed to members of the Chicago Fire Department (as well as any civilians who are displaced by the fire and request food and beverages) are handed out free of charge. 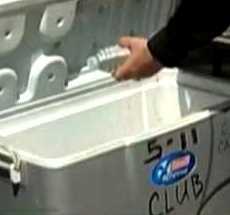 The 5-11 Club is a private charitable organization that is exempt from income tax pursuant to Section 501(c)(3) of the Internal Revenue Code. 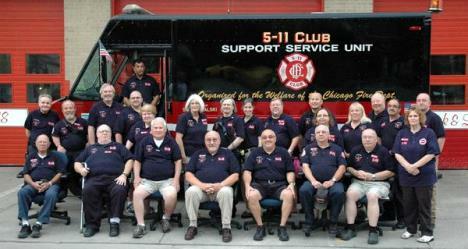 The 5-11 Club is operated in corporate form. Policy decisions are made by an elected Board of Directors, while the day-to-day affairs of the Club are managed by the elected officers, each of whom also sits on the Board of Directors ex-officio. 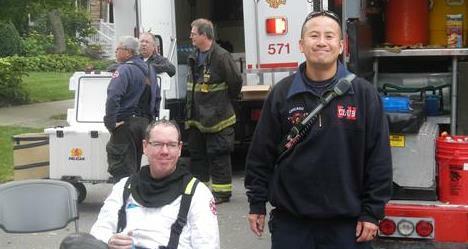 The 5-11 Club is engaged in a number of activities that are designed to provide direct and indirect support to the Chicago Fire Department and its members.